Ductless System | Global Warming & Cooling, Inc.
Not all homes in the San Diego area have traditional air conditioning systems. Some are old and can’t support the necessary ductwork, and some have other limitations that prevent them from having a centralized system. For these homes, ductless mini split systems are a practical and cost-effective solution. If your home can’t support central San Diego air conditioning, contact Global Warming & Cooling to learn more about our ductless systems. Our HVAC technicians have experience working on all brands, including Lennox, Mitsubishi, Daikin and LG. Ductless mini split systems are capable of delivering hot and cold air throughout the home without using traditional air ducts. Instead, several smaller units are installed in the home to keep it comfortable. Each unit can be operated individually, allowing you to control the temperatures in sections or “zones” of your home. Improved indoor air quality. The HVAC equipment that is used to pump cold and hot air throughout your home can make you sick if it’s not installed and maintained correctly. With our team of technicians, you can expect exceptional service and installation. Our systems are equipped with advanced filtration technology and washable filters. Improved energy efficiency. Do you want to save money on your utility bills? With a ductless system, you can. These systems utilize the air that’s already there to keep your home comfortable. Many are small in size and Energy Star rated. Not only can you decrease your energy bills but also your carbon footprint. Enhanced comfort. Since each system can be adjusted individually, you can reach maximum comfort in your home with a mini split system. For example, heat rooms only when they’re occupied or keep your bedrooms cooler while you sleep. This reduces energy consumption as well. Greater flexibility. Our HVAC contractors in Poway can install your ductless system almost anywhere you want, such as affixed to the wall, suspended from the ceiling or mounted onto a drop ceiling. Floor models are also available, and installation can be completed in a few hours or less. If you already own a ductless system and are in need of maintenance or repairs, our HVAC technicians have you covered. 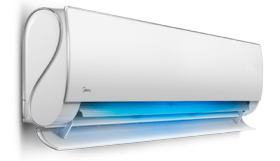 We have experience working on all makes and models of ductless systems, including Mitsubishi, Fujitsu, LG, and Daikin. Even though these systems are generally low maintenance, problems can develop over time. Some of the most common signs that your ductless system needs attention are strange noises, ice on the coils, leaking fluids or a loss of cooling power. Count on our team to be there right away so that you know what you are dealing with. We provide honest, upfront estimates, top-rated parts and components and a workmanship guarantee. For installation, repairs or maintenance on your ductless mini split system, contact Global Warming & Cooling today.